Welcome back to Winnie & Walter’s 2nd belated Birthday Bash release day #2. Hope you liked yesterday’s day #1 preview. If you haven’t seen it, here is the link!. Today we are premiering Scenery: Into the Woods stamp set ,Wishing You with Evelin T Designs stamp set and True Multifaceted Border Cutaways. I liked the True Multifacted Border Cutaway. I wanted to show how well they are designed. There is the solid background border both long and short and the outline die both long and short. The long dies fit the landscape card front and the short ones fit the portrait card front perfectly. How cool is that? I used the short outline die to make my card. I did a rainbow Multifaceted background with the border die. I sponged distress inks in rainbow colours on strips of white cardstock. The coloured I used are Candied Apple, Fossilized Amber, Twisted Citron, Mermaid Lagoon, Wilted Violet and Picked Raspberry. Then I sprayed some shimmer on all the strips. Once dry, I die cut them using the short outline border die. I saved all the bit and pieces that fell out. On a white cardstock panel, I adhered all of the die cut in rainbow order. Then I randomly put a few pieces back ink place. There is an order yet fun with randomness. I liked that a lot 🙂 I then trimmed off the edges of the panel. For the sentiment, I white heat embossed the sentiment from Wishing You with Evelin T Design stamp set on vellum paper and wrapped it around the diecut panel. I added some sequins from Little Things by Lucy Walter’s Shaker Collection. Make sure to stop by for Day #3 premiere tomorrow. What a bright and cheerful card. Loving this die. 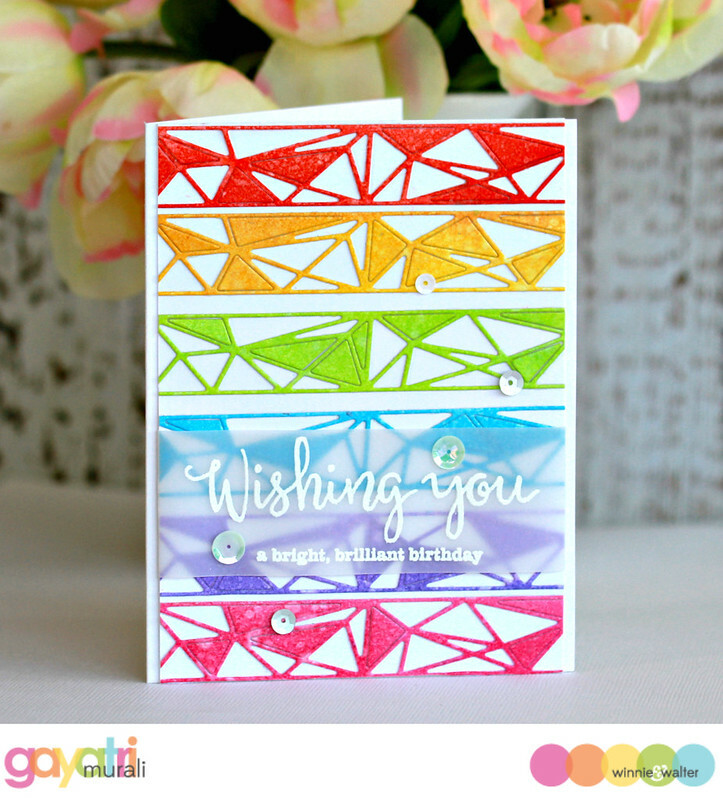 Wonderful bright card Gayatri. I can see lots of uses for this die thanks for sharing and also for your kind comments on my card entry for SSS Shake it up challenge. 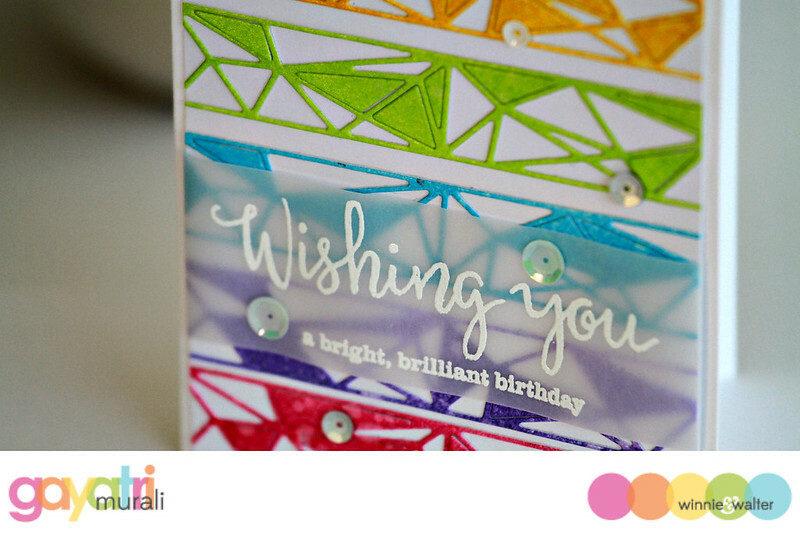 Love the bright colors on this gorgeous card, love that multifaceted border cutaway! This is so cool, Gayatri, love! !